Sadly, the Cedar Covered Bridge was nearly destroyed by arson on April 15th, 2017. 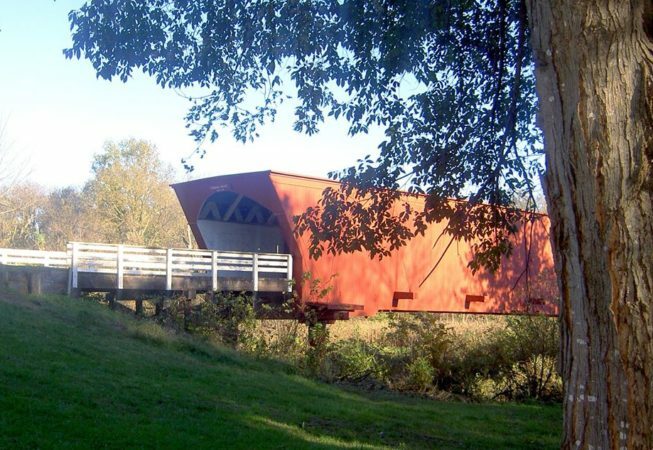 Efforts to rebuild this beloved icon are underway, and you can follow its progress on Facebook at Rebuild Cedar Bridge. Built in 1883 by Harvey P. Jones and George K. Foster, Cedar Bridge was 76 feet long and was the last bridge open to vehicles. It was built over Cedar Creek north of Winterset on what is now US Highway 169. It was moved to its present location over the same creek in 1921. In Robert James Waller’s novel, The Bridges of Madison County, Cedar Bridge is where Francesca Johnson goes to meet Robert Kincaid to help him take photographs. Cedar is also the bridge on the novel’s cover. The bridge was renovated in 1998 at a cost of $128,073.